And speaking of the recently deceased Ronald Neame, let’s take a look at his other disaster movie, made seven years after the eminently entertaining The Poseidon Adventure. Sadly, Meteor is an inferior film in every respect. Not that the cast isn’t talented enough. Sean Connery plays the gruff NASA scientist Dr. Paul Bradley, who left the space agency after his invention – a satellite called Hercules, armed with nuclear warheads – was hijacked by military interests and aimed at Russia, rather than used as the meteor defense it was intended to be. When it is discovered that a 5 miles wide asteroid is headed for Earth, Bradley is brought back into service by his boss (Karl Malden). Bradley realizes that the Hercules alone will not be enough to stop the approaching asteroid, and so convinces the president (Henry Fonda) to enlist the help of the Russians, who have a nuclear satellite of their own. A Russian scientist (Brian Keith) is brought into the operation, against the vehement objections of the military (represented by Martin Landau). The Russian is accompanied by his pretty assistant/secretary (Natalie Wood), who of course catches the eye of Dr. Bradley. As the first pieces of space rock hit Earth, causing lethal avalanches, tsunamis and other mayhem, this team works against the clock to get the satellite defense ready. 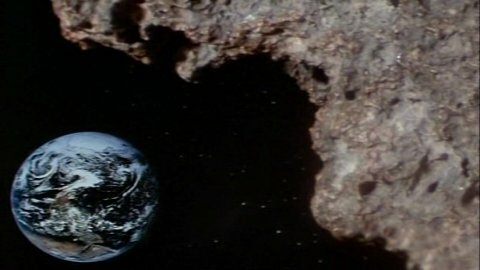 The first thing that came into my mind, as the bombastically scored opening credits rolled, and the pompous narrator began lecturing about comets and asteroids, was how outdated it all felt. And I’m not talking about any 70’s vibe here – this film was released in 1979 but some of it feels like it was made in the 1950’s or 60’s. The plot, which is pretty much your standard asteroid movie set-up, though a bit more concerned with international politics than most, moves oh so slowly, offering unneccessary flashbacks and lots of contrived dialogue. The special effects are wildly uneven, with both some nice model shots and some really dodgy compositing work. Strangely enough, as the asteroid gets closer and the suspense should mount, it actually feels as the whole movie slows down. This is to a large extent due to the absurdly sedate space action sequences: the nuclear warheads are not so much launched as just gently nudged in the direction of the asteroid, after which we’re treated to endless shots of unconvincing rocket models moving in slow-motion through space. The use of stock footage and borrowed sequences from at least one other film (1978’s Avalanche) give parts of the movie a somwehat disjointed feel, and the climactic explosion of the asteroid may well be the longest single explosion I’ve seen on film. It’s lika a long, slow roar that goes on forever. I suppose someone felt they had to give the audience some bang for their bucks after waiting for so long for something to happen. Meteor is unequivocally not a good movie, but I’ll admit I enjoyed watching fine actors like Karl Malden and Martin Landau hamming it up (Landau’s character, a major general, at one point throws a tantrum worthy of a teenage girl), and Sean Connery is kind of cool even when just drinking coffee, staring at screens and delivering clumsy pickup lines to Natalie Wood. The single best action sequence occurs as a meteor impact demolishes the underground base where the Hercules operation is headquartered. The survivors make their way out through the subway system as suddenly the walls crack open, releasing a flood of muddy water. One incidental character actually drowns in the thick, brown sludge. Perhaps not the most expected way to perish in an asteroid flick. I enjoyed the review, and I’m enjoying the site. It’s been awhile since I’ve seen Meteor (as an afternoon matinee on Syfy back when it wasn’t Syfy), but I’m pretty sure the spacecraft in the film were badly lit models of Skylab! I remember laughing my head off at that! I remember feeling ripped off that a major movie i paid money to see had stock footage of buildings being demolished( the slow falling down in a neat dust pile kind) in the main impact scene.However,i love the quick glimpse of the glowing red hot asteroid laying in a crater in the middle of central park after it sliced the world trade centre in half…very cool.